As a child—never heard of the preferential option for the poor or anything about Liberation Theology. We always had mite boxes every year for the poor in China and other Third World countries but never anything like what goes on today. 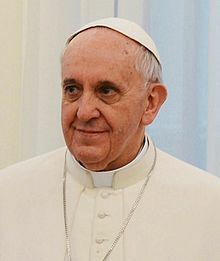 I am disturbed by priests and now even our new pope who want to eliminate poverty. Isn’t poverty a relative term? It is like trying to eliminate weather or disease…. Didn’t Jesus say of the poor—they will always be with us? The poor are part of the human condition…all derivatives of our fallen nature…that is original sin. Remember also the beatitude is not blessed are the materially poor…but the poor in spirit. When it comes to greed, the wealthy don’t have any monopoly on it! Poor people can be just as greedy as any capitalist. Isn’t that what FDR’s New Deal was all about—soak the rich and class envy? Isn’t it also true that in America we have the most obese, and over-fed poor in the world? I would venture a guess that the poor in this country would be middle class in 90% of the other countries in the world. Many now live on an unearned income of $40,000 a year, which would put them in the hated 1% of the world’s wage earners. Since Lyndon Johnson’s War on Poverty, which was more a war on poor people, government has institutionalized poverty, totally impoverished the black family by replacing husbands with welfare checks. In effect this will just level…not only the playing field but reduce everyone to bare subsistence. We have nearly 100 years of communism as empirical proof. To the left the best way to eliminate poverty is to make everyone equal…equal in their poverty. An expanding government sinks all boats. This social-economic war has cost us approximately $17 trillion since 1965; we still hear that was not enough! The poverty rate is the just the same…yet they still want more. In the Catholic Church talk of poverty leads to demands for justice…social justice. That’s another term I never learned in grade school or even in college. Does anyone here really understand what the Church means by SJ? I have deleted several definitions from my paper because I didn’t understand any of them. I don’t think it should mean being my Brother’s keep. Only slaves, prisoners and the mentally ill need keepers. To me the only kind of justice we owe our neighbor is to give him his due by way of agreement, contract, handshake etc. and try to help those who cannot help themselves. Delegating this responsibility to Uncle Sam is NOT SJ. It is national suicide! Neither social justice nor redistribution of wealth is in the Gospels nor the US Constitution. These are not religious ideas but Marxist ideas. Jesus never said, Take from the rich and let the government redistribute it. Take the parable of the Good Samaritan. The Samaritan chose to take it upon himself to help; he took on the bills himself. The government never told him to do it. All these progressive ideas have come together under the mantle of Liberation Theology, which is a perversion of real Christianity. Liberation Theology is not a religion of love and sacrifice with salvation of souls as its goal but one of violence, oppression and eventually moral and economic slavery. But before I get into an explanation of Liberation theology I want to take it a step…backwards! They say success has many fathers while failure has none. I guess that means that Liberation Theology is a huge success because it not only has an international parenthood from Moscow to Medellin but some grandparents and great-grandparents that date back to the French Philosophes and the French Revolution. The Enlightenment was a cultural and intellectual movement of the 17th and 18th centuries, which successfully threw off the yoke of several hundred years of Royal and Church rule in France. Its purpose was allegedly to reform society using reason, challenge ideas grounded in tradition and faith, and advance knowledge through the scientific method. In effect it promoted religious skepticism, disrespect for order and intolerance of anything that did not fit its agenda. They are all branches of the same poisonous tree. What happened in the drawing rooms, libraries and coffee houses of 18th century France resembled in at least one crucial respect what happened in the deserts of Arabia in the 7th century A.D? A new world religion was born—a secular religion of humanity. The Enlightenment gave rise to the bloody French Revolution with its liberation of all the rules, regulations and dogmas that had characterized Mother Europe since the beginning of the 2nd millennium. In effect the Enlightenment evoked a new world order of slavery that took away man’s moral anchor and chained him to his passions. Liberation Theology therefore is not a new idea but the new wineskin for the pernicious ideas of the Enlightenment. In modern terms it is the new secular religion of men, a religion of the poor. To Build the World anew! According to late mathematician and member of the Soviet Academy of Sciences, Igor Shafarevich to accomplish the collapse of Western Civilization, government has had to attack and dismantle the three major barriers to complete secularization of its population, that is…the Christian religion, the natural family and private property. In essence this has been the nexus of the culture war—an attack on religion…the family and private property. Just what is Liberation Theology? It is a movement that sprang from late 20th-century Roman Catholicism and has found a particularly welcoming environment in Latin America. By definition: Liberation Theology is not a theology but an ideological amalgamation of the spirit of Jesus Christ with the revolutionary tactics of Karl Marx. It is rests on the belief that one’s eternal salvation is inseparable from the struggle toward social justice. In America it emanated from the Progressive Movement where socialist Herbert Croly, the founder of the New Republic Magazine in 1907 made a similar amalgamation by melding the democratic and charitable spirit of Thomas Jefferson with the big government means of Alexander Hamilton and capitalism to give us the never-ending welfare state under which we suffer from today. To them, the WORD oppression is a clarion call to assemble all like-minded revolutionaries who will work to undermine the traditions, morals and beliefs of the past…the so-called Democracy of the Dead of G. K. Chesterton. 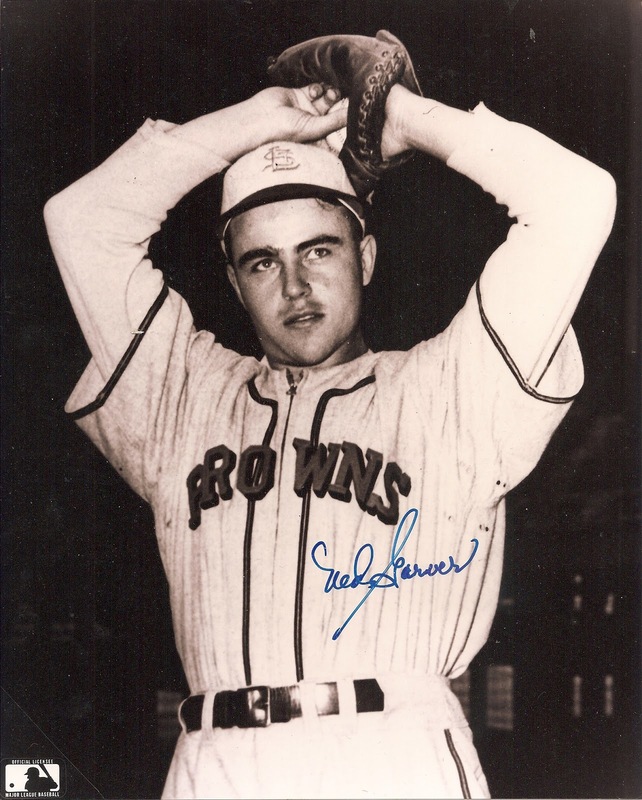 Memories have always been extremely important to both professional baseball players and their millions of fans throughout its long and variegated history. To me baseball has always been the human game because it rightfully focused more on the players and not as much on their statistics. Most baseball players, especially old ball players, thrive on telling stories, based on their long memories. The more baseball transforms to a Sabermetrician mode of Moneyball, the less attractive it will become to fans like me. I think this underscores the idea behind Roger Kahn’s historic 1972 book, The Boys of Summer. What made Kahn’s book so enduring was that it did not focus as much on the individual playing careers of many of the 1952-53 Brooklyn Dodgers, a team that had teased its fans with pennants, only to falter to the hated New York Yankees in the October Classic. To the contrary Kahn took the high road and looked at the players after the cheering had died down and they were left with declining health, old age and even ensuing death. 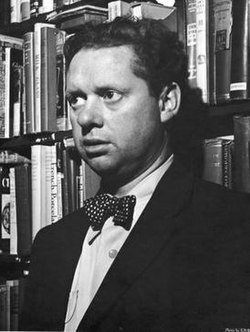 Kahn underscored this in his lyrical title, a phrase lifted from Dylan Thomas’ poem of I See the Boys of Summer… I see them in their ruin. 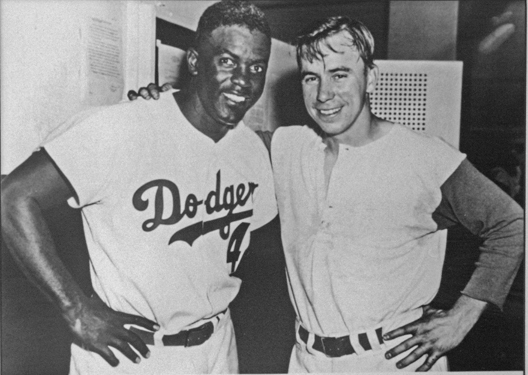 Kahn had stripped the players, especially Jackie Robinson, Clem Labine, Duke Snider and Carl Erskine of their uniforms, pretenses and defenses. He showed them in their pure humanity with Robinson’s illnesses, Erskine’s handicapped son, Labine’s war-handicapped son and Snider’s ruinous business dealings. To most of us this was a new and troubling side of players whom we had seen mostly in terms of home runs and box scores. The ideas in Kahn’s book were reinforced for me years later at a card convention. I was walking among the crowd and I spied an old man sauntering about. He was bald, round-shoulders with a protruding stomach. 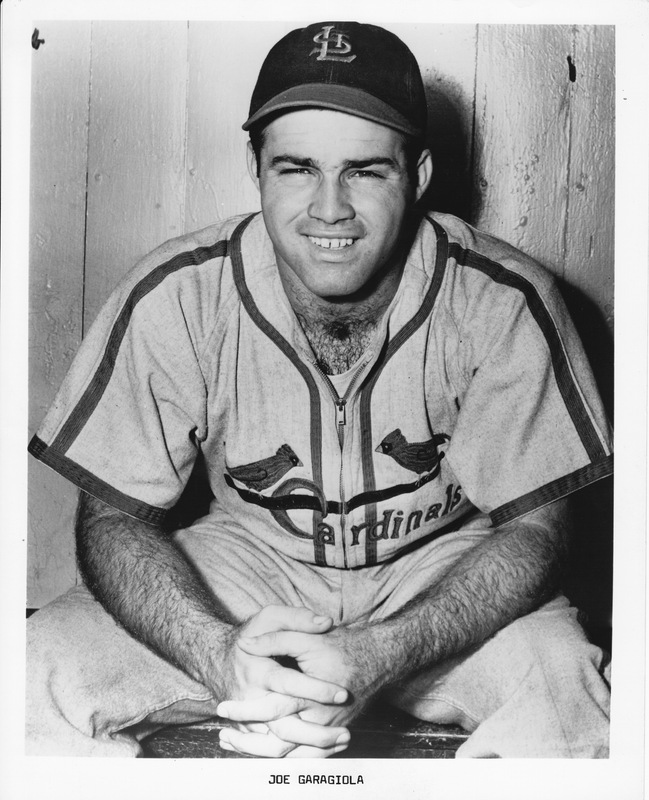 He was Enos Slaughter, the old Cardinal great, known for his mad dash from first base in the 1946 World Series. To me he looked just like a little old man…like any other man of his generation I could see walking on any street in America. I thought, so this is what happens to old ball players. This reminds me of something Joe Garagiola told me when I interviewed on the set of his failed attempt to launch a pilot game show in 1974. Sometimes the joke was on him! His producer had quipped that Joe had shot down more pilots than the Luftwaffe in WW II. Joe said that the people who had the hardest time in seeking a new profession were shepherds Vikings and old ball players. I think there is an inherent wisdom in that because all players knew that their ticket would have to be punched sometime for them to get off the field. 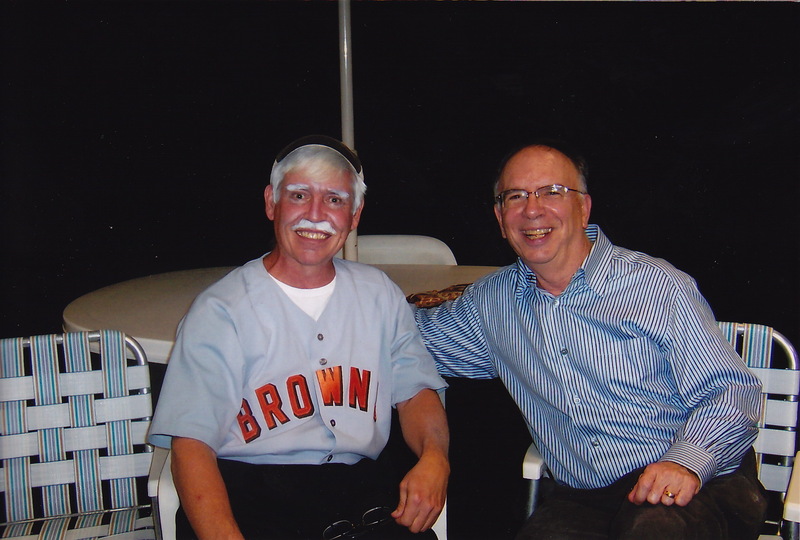 I think that point is one of the underlying beauties of the St. Louis Browns Fan Club, which I started with Harmony Lineback in 1984. Over these past 29 years I have seen so many of these players–Ned Garver, Billy Jennings, Don Lenhardt, Ed Mickelson and so many others in their tragic ruin. For most it has been the slow but steady decline or what a gal at the Mid-County Y had said to me after our workout class many years ago, the ravages of age. I have seen it in its persistent sap the strength, cloud the vision and wobble the step of what were once hardy, muscular athletes. The inevitable scythe of death has cut down all but 27 of our Brownie players of the 796, who wore the colors since 1902. For most of these surviving few their memories are all they have left. It was this thought that prompted me to write my play, The Last Memory of an old Brownie Fan in 2007. My mother had died of Alzheimer’s in 2001. Since then I have been deeply concerned about losing my own memory, which has been key to my joie de vivre. After a certain age our memories are really all we have left. The play served as a cathartic metaphor for the similarities between baseball and the game of life. Fortunately while their bodies have suffered their often painful and inevitable declines, the Browns Fan Club has given many of them a chance to renew old acquaintances but more importantly to relive their memories, entertain the fans, new and old with their innumerable stories of gags, games, and fights. Absent cameras, writers with pen and pad, our many events have created a speaker-friendly environment where players can freely and without inhibition tell their stories, and their personal histories in for all of us to vicariously experience what they have kept alive in the mystic chords of their baseball memories. In reflecting on all these years, I need only give one example to illustrate what I mean. Babe Martin, who admittedly had a short-lived career, spent a lot of time in spring training, sitting on the bench or warming pitchers up in the bullpen. He hobnobbed with Ted Williams and other luminaries of the game. At on luncheon he starting talking about his friendship with old Teddy Ballgame. I remember looking at his eyes. They weren’t focused on me or anyone else in the 110 people in attendance. He looked over all of us…straight into space…trying to picture the frozen images of his memory from 60 years in the past. It was as if he had suspended his mind, his feelings and emotions on the precipice of eternity and was viewing his life from the outside. His eyes saw something that only he could see. His frozen moment in time transcended time and space and has become part of my memory trace and will be frozen in my own mind so that I can tune it in with clarity of detail anytime I want to. That reality lives and breathes in the memories of all the millions of fans who have penetrated the mystique of a game played by boys in the hot summer’s day and now night. 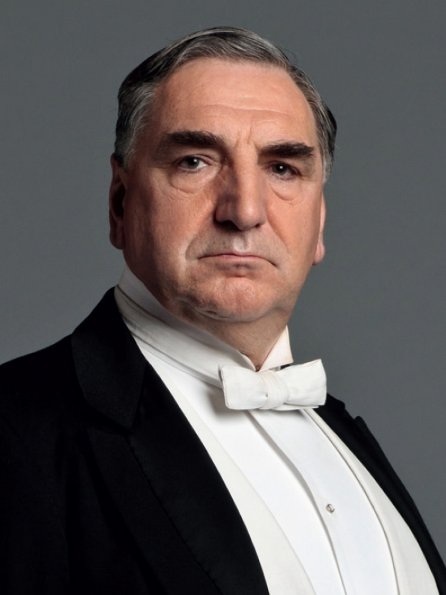 And in the powerful words of Carson the rigid head butler on the immensely popular BBC production, Downton Abbey, the business of life is about the acquisition of memories and in the end that is all we have.